Outstanding pair of Art Deco sconces, circa 1930 with screaming Deco design. Here we have an original antique in a complete, unique, pair of iconic Art Deco double sconces. The Art Deco motif on the backplates and arms are really quite pronounced, and so typical of the era and design. The backplates are cast iron, with a red-bronze finish. Completely rewired in our UL shop with new sockets, and a nice original-style rotary On/Off switch for each sconce. The candle tubes were renewed as well. 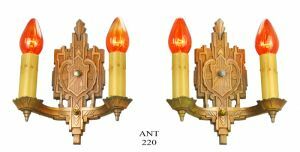 These sconces are complete, and come with all the mounting hardware. Ready for installation. Price: $485.00 for the complete re-wired pair of sconces, plus packing and shipping.